LOCATION A two bedroom semi detached property set in a popular development to the north of Horsham town centre. Littlehaven station (serving London Bridge & Victoria) is less than 1 mile from the property, as is the A264, with quick access to the M23 & Gatwick Airport. In addition, the house is within a short walk of two local primary schools, with both Millais & Forest secondary schools around 2 miles distant. The property is located within the busy town of Horsham, which offers a thriving town centre with a wide selection of restaurants, cafes and shops including a John Lewis At Home store and a larged Waitrose. THE PROPERTY A well presented two double house set in a popular cul-de-sac in North Horsham. The property is set over two floors and briefly comprises; downstairs cloakroom, neutrally decorated lounge/dinning room with storage cupboard and doors to the rear garden, modern fitted kitchen with appliances to include washing machine, dishwasher, tumble dryer, and oven. To the upstairs are two double bedrooms, the master with fitted mirrored wardrobes and a modern bathroom with shower attachment. 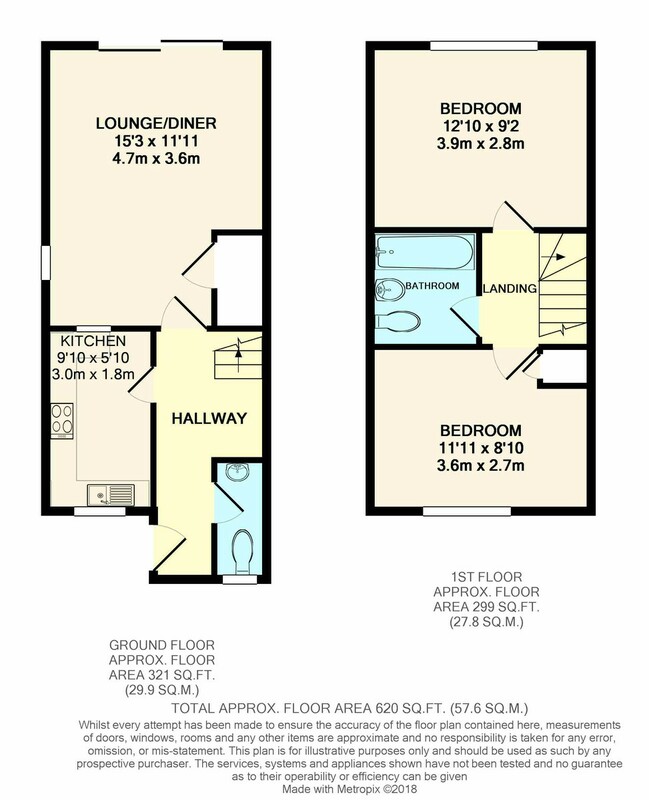 This property also benefits from central heating, and is offered to the market unfurnished. OUTSIDE To the rear of the property is a well maintained low maintenance garden. To the front is allocated parking for one car and on street parking.